In the battle of the compact sedans, it is hard to think of two bigger titans than the 2013 Honda Civic Sedan and the 2013 Ford Focus. The Civic, currently available at Middletown Honda near Mechanicstown, gives drivers a more affordable, more fuel efficient, better-equipped ride than its competing vehicles — but is it a better choice than even the Focus? 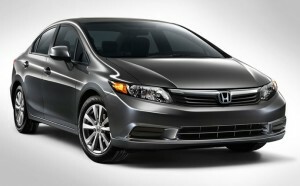 The only name in compact sedans we hear anywhere near as frequently as Honda’s is Ford’s. While the 2013 Focus is an impressive vehicle, we think you’ll agree with us that the Civic is the way to go if you’re looking for a compact car once we’re done comparing the two. There’s no better way to put it, really, and that’s not to speak ill of the 2013 Focus, as it puts up a good fight. Honda wins the battle in inches, but they are all the ones that matter. Honda’s new sedan is less expensive than the Focus, with its base LX model starting at $18,165*, and it will keep saving you money at the pump too, with an EPA-estimated city fuel economy for the automatic model of 28 mpg** to the Focus’s 26 mpg. While there was an age when drivers accepted that the “compact” in “compact car” meant “squeezed in,” that’s just not the case anymore — unless you drive a Focus, that is. The Civic offers more headroom, front and rear legroom, and front shoulder room. The vehicles are comparable in essentially every other respect, meaning that you save money and are given more room and more features with the Civic. It seems crystal clear to us, but at the end of the day, you’ve got to see how your next car drives yourself, and that means taking a test drive. If you have any questions about the Civic or want to schedule a test drive, contact our dealership. Better yet, visit Middletown Honda in person — we’re just a short drive away from Mechanicstown and we can’t wait to see you behind the wheel of a new Honda.